Do you wonder why generations shop differently, vote differently and have different notions about work ethic? You’re not alone. That’s why we made our Top-12 List. If your question didn’t make the list, contact us. We are your go-to gen geeks! 1. What is the definition of a generation? Your generation is simply the group of people who grew up around the same time you did. Of course, each person is an individual, yet all the members of a generation shared many of the trends of the times—technology, the economy, educational trends and parenting tends for example—and developed similar attitudes and traits in response to those trends. Talking about generations does not mean we are putting people in boxes. I can’t really know you just because I know your generation. But knowing a person’s generation does provide some powerful clues about how his or her generation is likely to behave when building a career, shopping, managing money, voting, communicating, and a whole host of other things you wouldn’t expect. Even the way we get dressed to go to work or get the news throughout the day is gen-specific. It is important to remember that every person is an individual. But looking at people through a generational lens offers us some level of predictability when we want to reach, engage, inform or persuade a large cross-section of a population. That's why we offer keynotes on Marketing to and Innovating with Multiple Generations. 2. Are there groups that don’t fit generational patterns? Of course. Cuspers are good example. They are born during the years at the end of one generation or the beginning of another. Cuspers tend to have characteristics of both generations, making them good “translators” and natural leaders. Family makes a difference. If you had older parents or grew up with older sibs, you may behave more like generations older than you own. Other groups that tend to be different from their gen cohort are people who grow up in the military, on farms, or working in a family business. That gives them experiences and a perspective from outside the mainstream culture. Finally, first-generation immigrants tend to be a little different. Typically, they have the values and traits of a Belonging generation—working hard to establish themselves in a new culture. Second- and third-generation immigrants tend to be more like the birth cohort of their new country. 3. How did you get into this business? When my Millennial kids were growing up, I kept thinking about the ways their childhoods were incredibly different from my own. I had one of those “ah-ha” moments one afternoon when my youngest daughter was 13. As I watched her tear her room apart looking for a lost cell phone (the old kind that flipped open), I suddenly knew I had to write about this and about what it meant. As soon as I began writing about Millennials (that was before they even had an official name! ), people began asking me about how to work with this new group as employees. I began writing, consulting and speaking about Millennials and soon added other generations to the list. You can never talk about one generation in isolation because we interact all the time and everywhere. 4. What does Generational Edge do? We deliver Gen IQ Keynotes, workshops and Gen IQ trainings. We also consult with companies about generational strategies. That often means creating a customized Gen IQ Generations Playbook for a company, working with political groups to help them reach generational cohorts, or consulting with a company about marketing messages that resonate with specific generations. 5. What makes studying generations interesting? I get to uncover all kinds of trends. It’s exciting! Generational studies are constantly evolving as each generation reaches new life stages and creates new ways of working, retiring, shopping, or just hanging out. With the help of researchers, I incorporate studies from sources like the Pew Research Center and governmental agencies. We use a macro approach for combing the news and social media to spot trends. When working with a client, we go micro and incorporate industry data and company research. 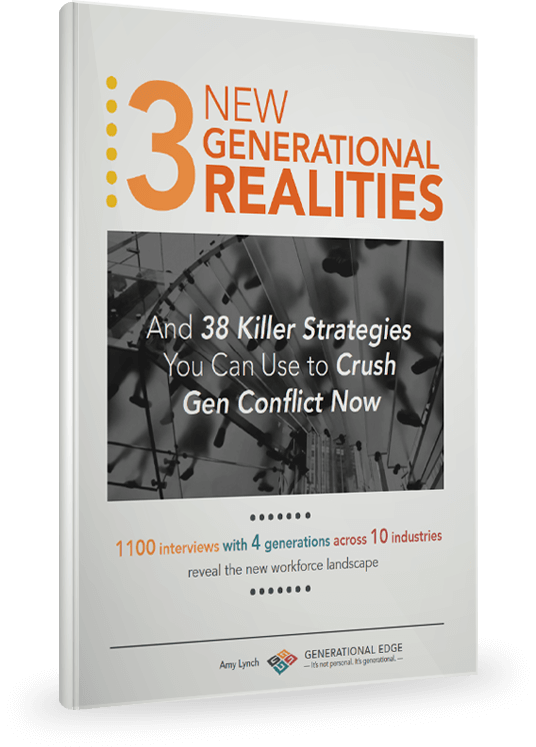 Finally, we use surveys to develop original studies and reports like our e-book Three New Generational Realities and 38 Killer Strategies You Can Use to Crush Gen Conflict Now. 6. Why do I see different birth years in different places? Usually when you see different birth years, they are off by only 2 to 4 years. Those differences are easy to explain in that different researcher rely on different data. For example, if you look solely at birth rates, which tend to change each time a new generation comes along, you’ll designate certain years. But if you look at big shifts in the economy, politics or in technology (all help shape generations), you’ll see similar patterns, but off by a few years. Similarly, enormous events, what I call a generational “Before and Afters” mark historic shifts and therefore shape generations. September 11, 2001 is that kind of event. 9/11 was the salient generation-defining moment for Millennials. In contrast, Gen Zs look at 9/11 as simply part of history. They’ve always known about terrorism and always taken off their shoes at airports. I try not to argue about birth years for generations. The specific years don’t matter as much as the big picture--the way events and conditions during a particular phase of history affected the people coming of age at that time. 7. Are generations consistent around the world? Yes and no. In every culture generations cycle through periods of optimism and skepticism, prosperity and recession, war and peace. Those cycles shape generations everywhere. In other words, you can find hard-working Belonging generations, followed by idealist Awakening Generation and skeptical Unraveling generations followed by solutions-driven 4th Turning generations everywhere. But they look different depending on the culture and the country. In the US, for example, we all Millennials, well, Millennials, but in China they are called the Little Emperor Generation. Millennials were the first generation that tended to be remarkably similar across many cultures and economies around the world, especially when it came to work and career. That said, geography always plays a role. Being a Millennial in the European Union a decade ago when unemployment was high was very different from being a Millennial during the same period in Silicon Valley as tech companies exploded. 8. Why are Millennials labeled entitled and lazy? Why are we constantly trashed in the media? One reason is that each new generation tends to be hazed when they first go to work. Gen Xers were labeled “Slackers,” if you can believe that. And Boomers where called entitled and the "Me Generation" just like Millennials are today. The simple answer is that each new generation works differently and brings new skills to work, and it's hard for older generations to understand and appreciate that. Because there is SO much media now, and because Millennials are such a large generation, they’ve gotten more bad press than most. Surely, we are just about through with this phase of trash-talk about the mS! First, Millennials have proven neither lazy nor entitled. Second, Gen Z is just about to make its presence known, to work differently and to take its share of workplace fire. In fact, Gen Z is likely to seem too complacent and passive to older gens, including the Millennials. 9. Why do generations have different lengths? This goes back to question one on this list. A new generation is shaped when there’s a major shift in the mood of the country, when big culture-shaping events occur (like 9/11 or the 2008 economic meltdown), and when birthrates rise and fall. As a result, there’s not a set 20-year time frame. A generation can last 15 years or 25, and anywhere in between. As change accelerates during an Unraveling and a 4th Turning, the generations coming of age then tend to be a little shorter—simply because everything is changing faster. As change decelerates during a period of Belonging, those gens tend to last a little longer. 10. What is Gen IQ? Great question. Gen IQ is short for Generational Intelligence, which is a mouthful, so I shortened it. Gen IQ is the ability to lead, market to or innovate with generations not like you. It is the new “smart” in a multi-gen workplace and marketplace. I pondered Gen IQ for years before I could really define it. When I began researching generations, I started seeing generational differences and generation gaps everywhere—at the bank, in the grocery story, the classroom and the doctor’s office. That was awareness. After a while, I began to see patterns. Finally I began to formulate strategies that can help bridge the gaps. Gen IQ is the ability to spot generational patterns and to ask genuinely curious questions about those patterns until you hit a “flip moment” when you simply get the way another generation thinks. Next thing you know, you’re designing strategies that bridge gen gaps. Ultimately, Gen IQ is the ability to get more done and find success by leveraging your understanding of the generations around you. 11. When will this fascination with generations end? Great question. I have been in the field for 15 years now, and I first thought the fascination would end about 10 years ago after the Millennials had settled into the workplace. Now I realize it simply will not end. First, because people are endlessly interesting, and second because each new generation will bring new challenges to the workplace, to the marketplace, to associations, communities and families. Finally, it won’t end because generational studies have been incorporated in to fields like sociology, anthropology, economics, marketing and history. Gen studies are useful, so they aren’t going away. 12. 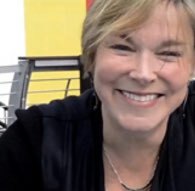 Can we hire you to give keynotes, consult, teach our leaders to use Gen IQ or write a Generations Playbook for our organization? OK, so this one wasn’t on the official list, but the answer is "Absolutely!" Let’s talk.